The beautiful Kamogawa in Kyoto City connects the Takano River and Kamo River. In this article, we introduce the fascinating rock sculptures found at Kamogawa Delta and how to enjoy your time at the riverbank like a resident. Kamogawa is a river in Kyoto that runs north to south, connecting the Takano River to Kamo River. This iconic river contains much history and tradition. Kamogawa Delta is a triangular-shaped piece of land at the junction where the two rivers meet. It is abundant in nature and is frequented by Kyoto City residents. Impressive rocks formations can be found on the riverbank of Kamogawa Delta. These mysterious rocks have attracted attention from the media, curious about uncovering the origins and intentions behind these artistic pieces. Rock Balancing Artist, Ikenishi Daisuke, a chiropractor by day, creates these rock sculptures. Ikenishi started rock balancing art in 2016, and in 2017 he started working on the rock sculptures every day. On weekdays, he begins at 8:00 and spends around 20 minutes before heading to work. He dedicates more time to this art on Sundays and national holidays. The sculptures have excellent balance. Once the rocks are balanced, Ikenishi adds an extra touch by dampening the stones with water, bringing out their natural textures and patterns. We asked Ikenishi what he enjoys about balancing rocks the most. Ikenishi: "I enjoy seeing people's reactions when they view my works. It motivates me when I think about how my rock sculptures can bring a smile to others." "These formations get destroyed by strong wind or after getting touched by people. However, it doesn't matter to me. I enjoy the process more than the final product." Ikenishi added: "In the past, I used to be so focused while balancing the rocks that I blocked out the surrounding nature and sounds around me. However, this became a source of calmness for my spirit and mind. Over time, I was able to absorb the sound of wind and the voices of children." Now, Ikenishi can focus on his rock sculptures in front of people without becoming distracted. "What is challenging about rock balancing?" we asked. He replied, "There isn't much. The more rocks you balance, the more fun it is. Even if you are not good at it, it is hard to feel disappointed." It is clear how relaxing and enjoyable rock balancing is to Ikenishi. Try Rock Balancing for Yourself! If you are interested in rock balancing, why not try it out yourself with some advice from Ikenishi? This is one of Ikenishi's pieces. His secret is to choose a flat rock as the base and save the best piece for the top. He also shared several tips: make use of the unevenness or rocks, start simple, be aware of your strengths, focus, and not give up. We were also told not to hold your breath. Holding your breath will focus more strength in your hands, causing the rocks to collapse more easily. Children at the riverbank were also asking Ikenishi for tips. He told them, "Start searching for rocks that you felt comfortable with, keep trying, and do not give up." His advice sounded similar to that of a school teacher. "Do not force anything, understand your strength, do not give up, focus, do not hold your breath, and stack the rocks one at a time, at a steady pace." His words have a philosophical aspect to them and can even be applied to our own daily lives. There might be a connection between rock balancing and the way we live. This rock sculpture is the result of our first attempt at rock balancing. The rocks at the riverbank were warm to the touch, and each had a distinctive expression. We lost track of time, concentrating on the challenging process of balancing a slightly risky choice of rock on a more sturdy one. We felt overjoyed once we succeeded! It is inevitable that the rocks will collapse suddenly. Put your safety first before anything else when attempting rock balancing. These stacked rocks are found near the river bed, and their stable form stands out to those passing by. Discovering these rocks will leave you in amazement. These rocks also show how humans and nature exist together. Ikenishi shared that, a long time ago, a lady in her fifties once told him, "I have been feeling down recently, but for some reason, looking at your rock sculptures puts me in a good mood." Ikenishi does what he does for people to enjoy his work before it collapses and leaves the river bed. It seems like his purpose for being an artist reaches his audience. A crowd has gathered around Ikenishi. He is friendly and will happily answer any questions. People are also more than welcome to take pictures of the art or him working and share them on social media. Local and international tourists alike appreciate Ikenishi's artwork. We heard comments such as "Wow!," "That is not easy!" and "He's so focused!" If you see him, please tell the rest of the world about Ikenishi from Kyoto! Check out Ikenishi's Instagram account (daisuke__ism) for regular updates on his creations. 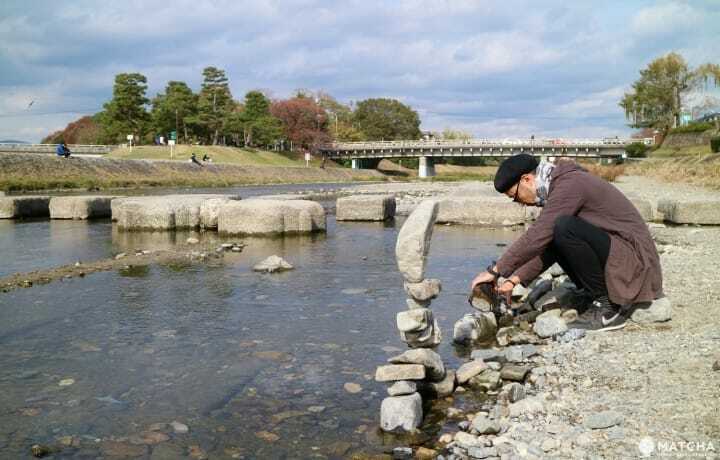 After experiencing rock balancing, let's explore the rest of Kamogawa! There are stepping stones near Kamogawa Delta. These stones allow people to cross the river and also help improve visitors' experiences of the river. Ikenishi's works can also be found here. Kamogawa Delta's stepping stones are also well-known for appearing in the famous anime series, "K-On!." There are also stepping stones in the shape of a turtle and bird. Be sure to take a photo! There is a considerable distance between each stepping stone, and the river's water level can become high. Please take safety precautions before using the stepping stones to cross the river. Use Exit 3 of Demachiyanagi Station of Keihan Electric Railway to get to Kamogawa Delta. Ikenishi's artwork is also located around this area. Within walking distance are the UNESCO World Heritage Site, Shimogamo Shrine, and Kyoto Imperial Palace, the former ruling palace of the Emperor of Japan up until 1869. We recommend seeing these destinations after visiting Kamogawa Delta. Be sure to visit Kamogawa Delta, a spot popular with Kyoto locals. Don't forget to look for Ikenishi's rock art and experience the natural landscape of Kamogawa! Kobishiya Chube In Kyoto - Make Your Own Mini Japanese Lantern! Explore Kyoto's World Heritage Sites Using The Keihan 1 Day Ticket!